SAILKARMA.COM - Sailing News, Videos and Photos! : coming up fast! Five regattas on the 2009 Audi MedCup Circuit means that each single regatta this season is more important, leaving less opportunity for crews to learn, change and optimise on the race course. With just four weeks left to the first regatta of the season, the curtain raiser that is the City of Alicante Trophy, TP52 and GP42 is coming up fast on the horizon. For teams who have to complete the preparation of their new boats, time will slip away quickly. The new Matador, having been built in Spain for Alberto Roemmers’ Argentinian team, will race this week at the Palma Vela regatta in Mallorca where three or four Audi MedCup TP52’s will compete as an important part of their build up to Alicante. So too John Cook’s Palma based Cristabella and both of the Russian boats Valars 3 (ex Mean Machine, Podolsky Kirill) and Synergy (ex USA 17) be competing at the big start of season regatta. Time will be short for the two Cookson New Zealand built boats Artemis (Torbjorn Tornqvist, SWE) and Emirates Team New Zealand’s first TP52 which are due to come off the ship in Valencia during the first couple of days in May (Spanish holidays permitting!). 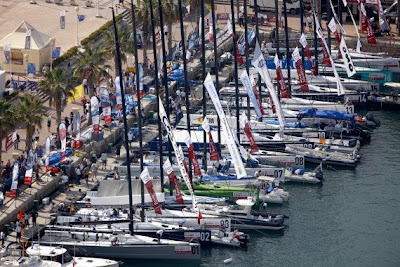 Thereafter the following weekend in Valencia a number of boats are expected to train and practise race, before a final work up off Alicante. 2008 Audi MedCup Champion Quantum Racing has been training and tuning recently and has been optimised through the winter months too: “We"ve developed the aero optimization and sail development and introduced changes to the deck detailing and layouts as well as modifications to the structures to further improve the boats dynamic behaviour.” Confirms Shaun Carkeek of designers Botin Carkeek. Jose Cusi’s 2008 Audi MedCup runner up Bribon was also due to be in action at the weekend and this week, but not racing on her native Palma waters. “We had not really planned it until we realised that we have a good opportunity with so many of the Bribon crew here to race at Palma Vela and a number are based here anyway and so it is a good opportunity.” Says Ignacio Triay, Bribon’s project manager. Eleven TP52’s and six GP42’s seems likely to be the entry for the City of Alicante Trophy regatta, but both Triay, and the TP52’s class manager Rob Weiland confirm there is still a promising level of interest and activity from all around the world for possible charters for TP52’s for single and two or three Audi MedCup regattas this season. “I think we might yet still see the same size of fleet at some regattas this season as we had last season which is quite encouraging. There is interest from several different countries which is very encouraging.” Comments Rob Weiland, TP52 Class Manager, who helps match potential charters to existing, available boats.